The thirst for water has transformed New York. The Dutch were sold on the island’s placement in the harbor at the mouth of the mighty Hudson River, making it a convenient waypoint for explorers and traders. Soon its ports had built the foundation for New York’s—and later America’s—financial sector. The city’s most influential nineteenth-century businessman, Cornelius Vanderbilt, got his feet wet in business first with ferries and steamships before building his mighty railroad empire. Manhattan is surrounded by water, and yet early New York would almost be undone due to a lack of it. Traces of the city’s centuries-long quest for clean drinking water can be found from the island’s tip to its top—from the site of spring water wells down in Bowling Green to the relics of old water systems that we’ve visited in the past few chapters. 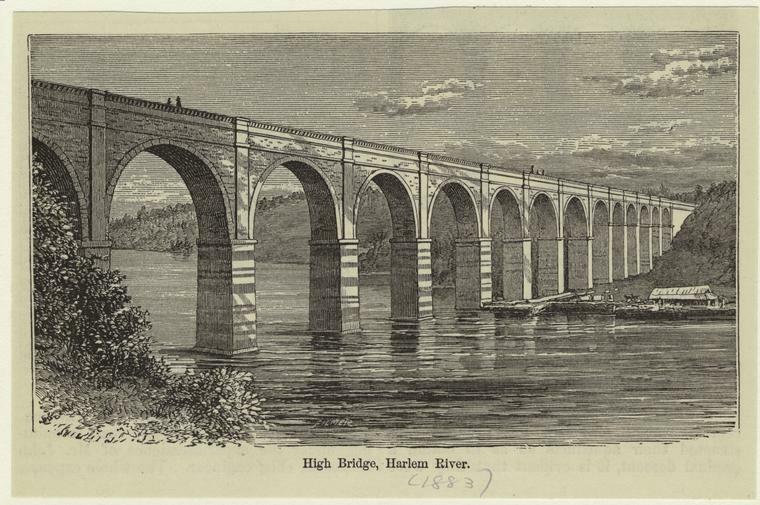 But no monument to freshwater dominates quite like the High Bridge, the Romanesque wonder linking Manhattan to the Bronx over the Harlem River. 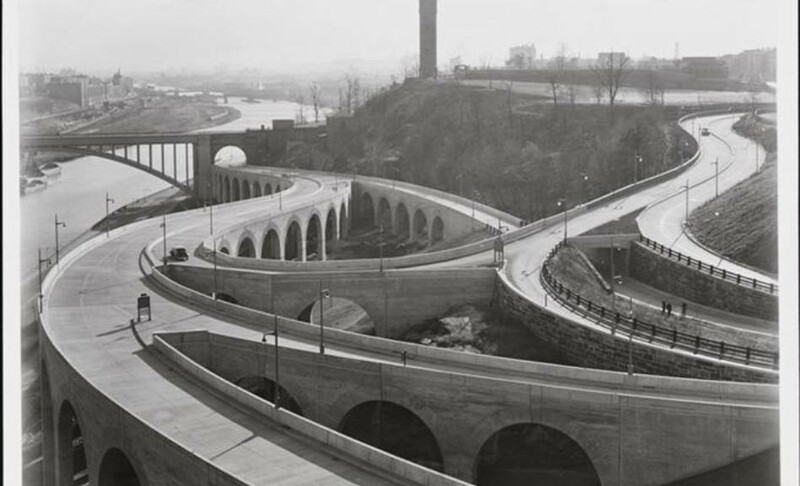 For many decades this majestic artifact, seemingly plucked from the hills of ancient Gaul, was a vital link in that great engineering triumph: the Croton Aqueduct. 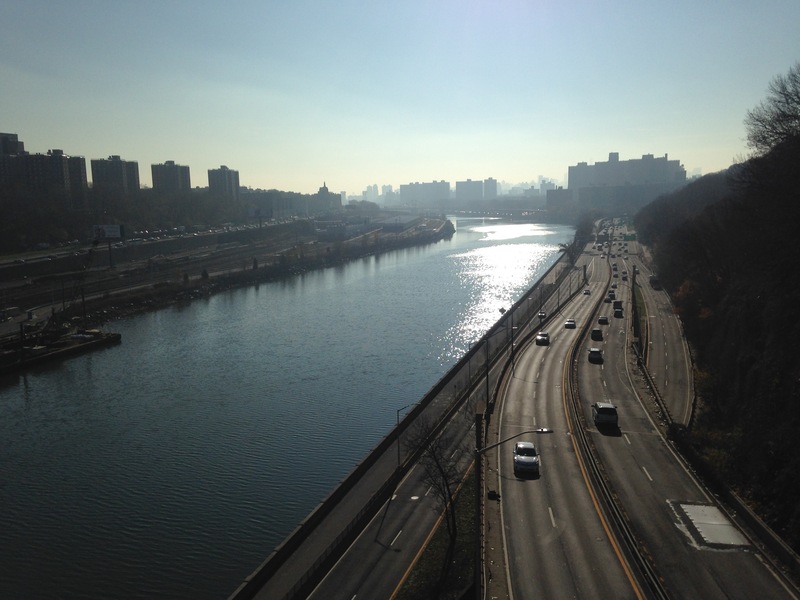 With the dense river traffic below and the icky-brackish composition of the surrounding rivers, early New Yorkers had to look beyond their waterways for drinking water. They dug cisterns and hunted down springs, but these couldn’t support the growing city. By the late eighteenth century, Collect Pond, a so-called freshwater source located northeast of today’s City Hall, had become polluted by the industries that surrounded it, and valiant efforts to bring water from other sources during the Colonial era were dampened by debt and war. Unfortunately for parched New Yorkers, he ended up using most of the funding for his company to establish a successful bank instead. More than a century and a half later, Manhattan Company merged with Chase National Bank to become Chase Manhattan, known today simply as “Chase,” one of the largest banks in the world. But his water distribution efforts ended up being woefully inadequate, and left Manhattan high and dry. By the 1830s the city was on the verge of a health crisis, as putrid water, poor sanitation, and all-around squalid living conditions culminated in a series of health epidemics and breakouts—which only heightened the urgent need for clean water. 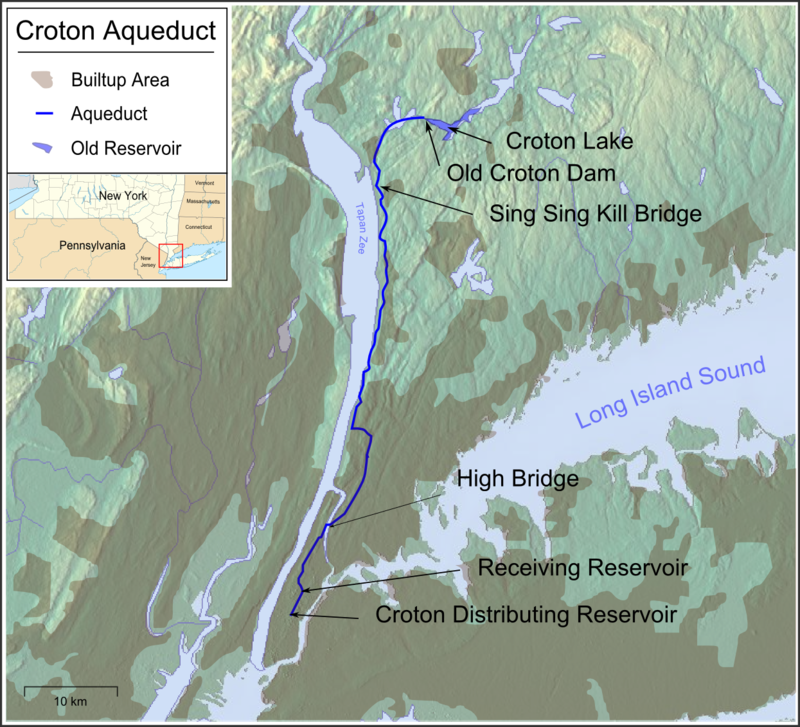 In April 1835 New Yorkers were so desperate for a freshwater supply that they voted in favor of a seemingly impossible plan: a pipeline that would bring the pure waters of the Croton River, forty miles north in Westchester County, down to city residents. Only underscoring the emergency, eight months later the Great Fire of 1835 would ravage the city. The aqueduct couldn’t be constructed quickly enough. 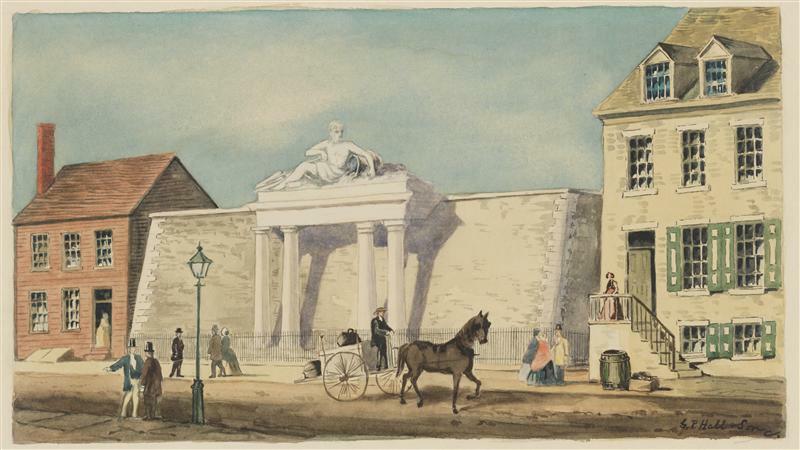 The elaborate project employed thousands of mostly Irish immigrants for many years (1837–1842). 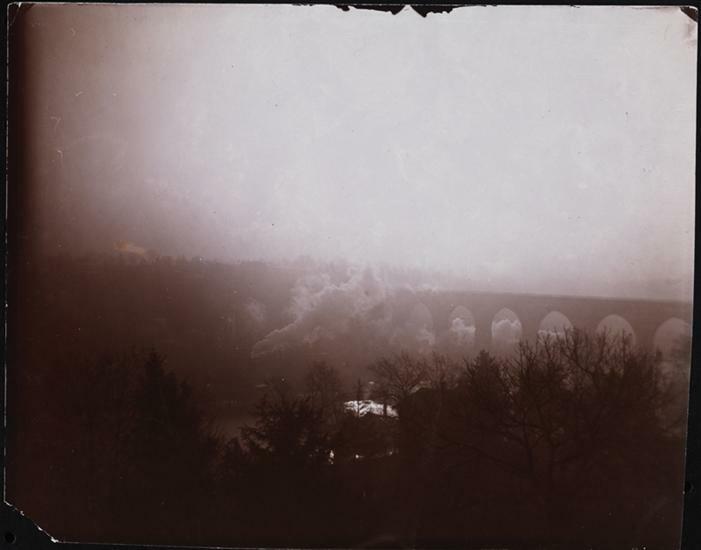 They constructed a sophisticated system of iron piping and brick masonry, which drew upon gravity to run the water through pipes and over arches, across the lush terrain of Westchester, and through the small towns that would later form the nucleus of the Bronx. But how would the water get into the island of Manhattan? 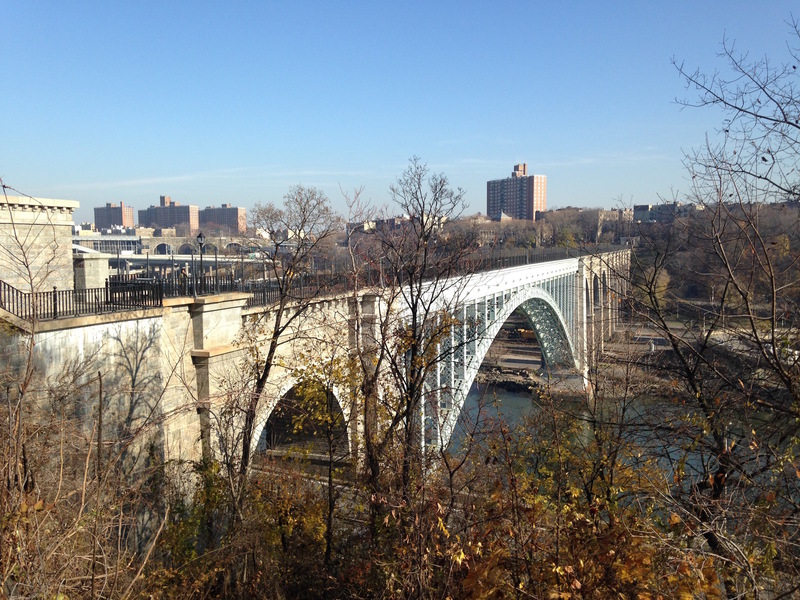 The aqueduct’s architects would need to find a way to keep it flowing across the Harlem River. Drilling technologies were not advanced enough in the 1840s to allow for a tunnel, so planners thought bigger—and higher. 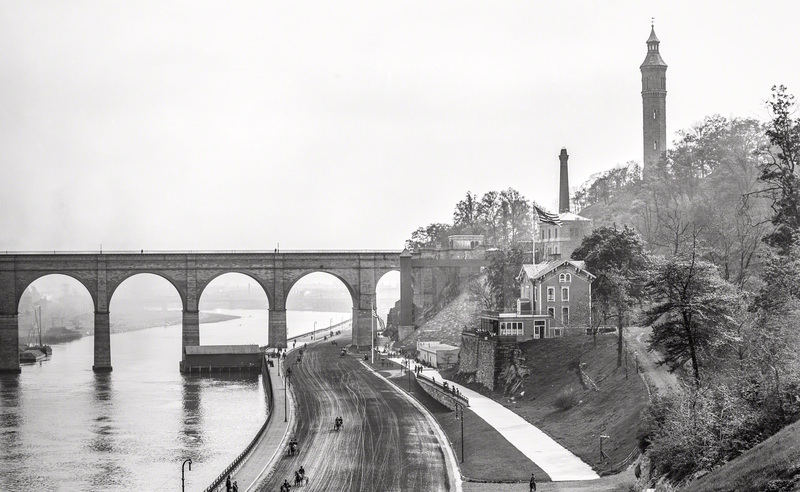 The High Bridge, at an elegant 1,450 feet long, is the oldest surviving bridge in New York. 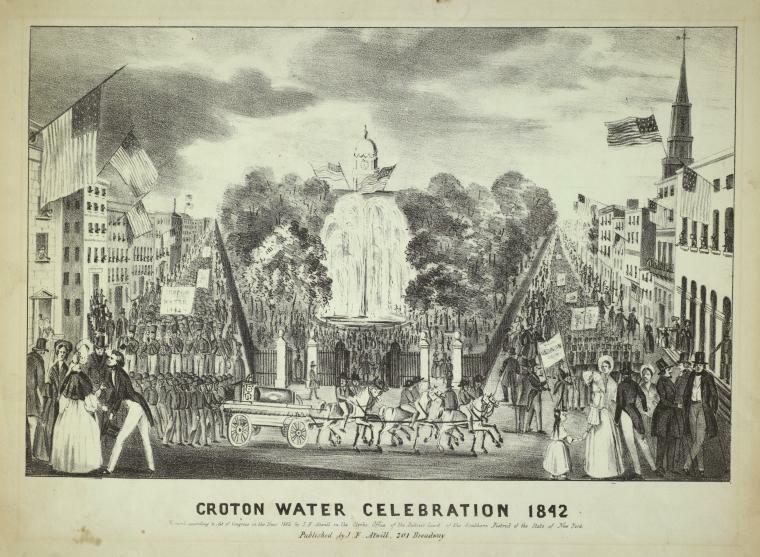 Completed in 1848, it not only brought the Croton water into the city, but it also made one heck of a statement noticed around the world. New Yorkers had pulled off a technological miracle, borrowing engineering and architecture principles not attempted, on this scale, since the glory days of the Roman Empire. They were changing the course of one river forty-one miles away and sending its waters high above another. When the water was finally turned on—flowing on October 14, 1842—the city threw a bash bigger than any since the expulsion of the British in 1783. 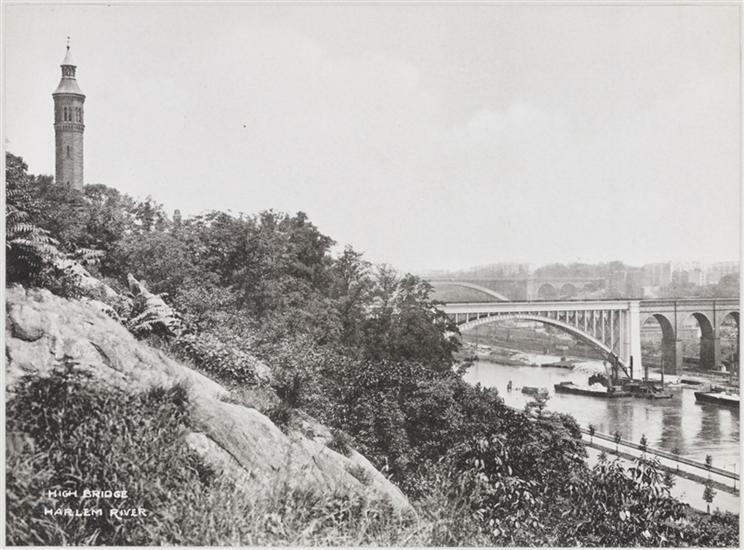 The water flowed through pipes across the High Bridge and to a receiving reservoir in the area of today’s Central Park, and from there to a distributing reservoir at 42nd Street and Fifth Avenue. From there it moved through the city, eventually to City Hall Park, where good, clean water shot high into the air and down into the City Hall fountain, to the delight of the public. Imagine— enough water to waste in a fountain! But the celebrated new system struggled to keep up with the demands of the growing city. 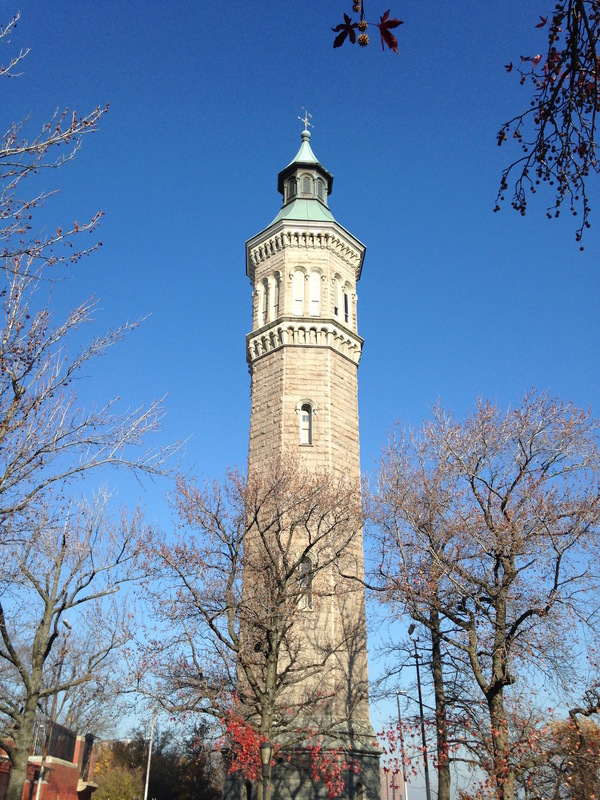 In 1872, as masses of new arrivals from far-off lands crammed into tenements, an attractive water tower was constructed near the High Bridge to help increase the water pressure into the city. 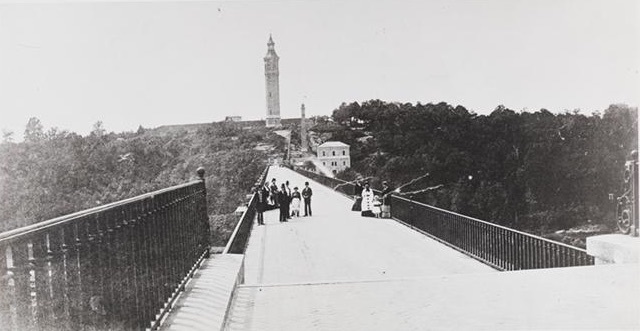 By this time the High Bridge itself had turned into an attraction, a festive promenade where young gentlemen and their parasol-clinging lady companions could stroll, taking in the striking views of the still-forested landscape that surrounded them, while millions of gallons of clean water coursed beneath their feet. But New York, growing larger every day, would need more water. Much, much more. 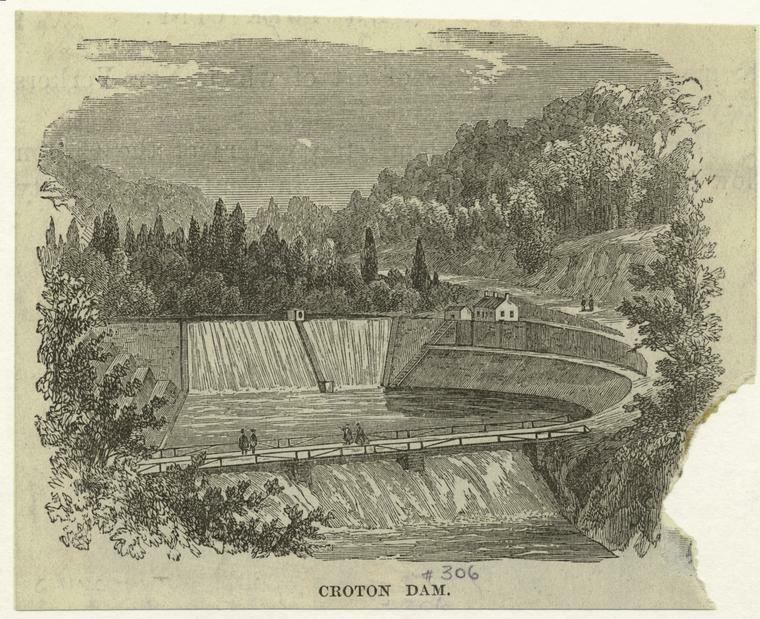 The introduction of indoor plumbing would require an entirely new and much larger Croton system to be built, which opened in 1890 and employed the massive Jerome Park Reservoir in the Bronx to satisfy the demand. 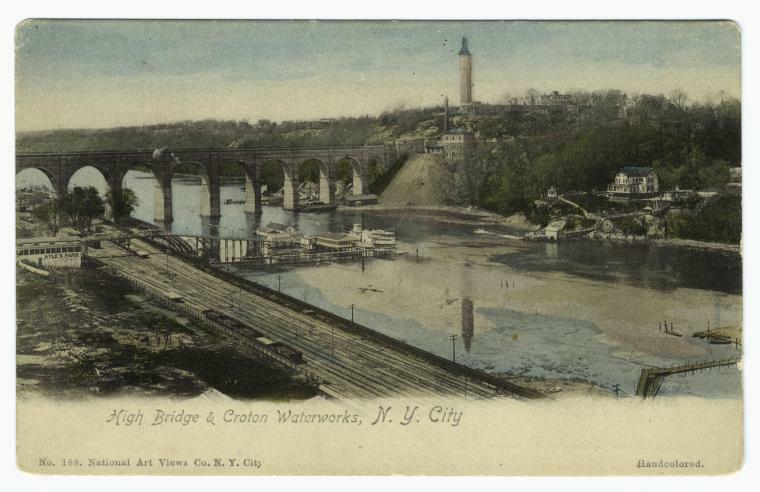 But alas, with a million flushes came the end of the High Bridge as an active part of the water system. Its function replaced by unromantic pipes buried underground, the bridge and water tower were retired from service by 1949, and soon these structures modeled after antiquity became historical relics themselves. In a surprising twist given the unforgiving tendencies of city planners of the day, it was probably the beauty of the bridge and the tower that kept them from being ripped down in a bit of “progress.” Motorists along the Major Deegan Expressway took moments from their traffic jams to reflect on the possible story behind these strange and magnificent artifacts, which grew more incongruous as the modern highway system developed around them. 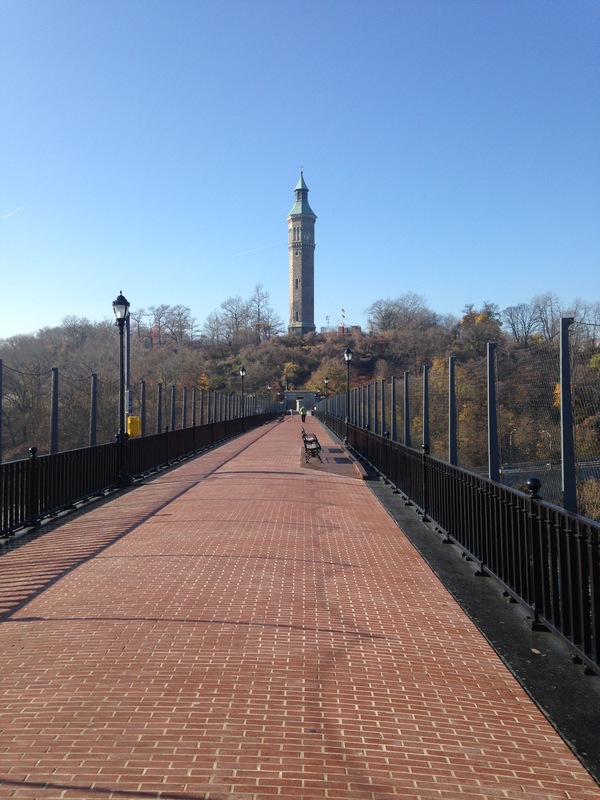 Two years ago this month, the High Bridge was restored, not for the movement of water but for those visitors and their parasols (replaced by headphones, we imagine) to enjoy a one-of-a-kind perspective on their buzzing metropolis. If you go — or rather, when you go, because you really must see it — reflect upon the water that once passed below you—it helped this city grow. Some images from my trip there in November. It’s three times as beautiful now!